From time to time my colleagues talk about who has seen the patient with the greatest number of strabismus surgeries. Some of us have seen people who have had numbers in the double digits. I can’t remember what the largest number was. The record in my office was a thirty-something woman who had undergone ten eye muscle surgeries. These were performed over the course of many years, at least two decades. A while back I posted a story on this blog – told to me by a colleague – that described a surgical consultation in which the doctor’s initial plan consisted of operating on one eye on two separate occasions and then operating on both eyes to complete the treatment. What I heard yesterday was a lot like this story only without the benefit of any kind of warning. The ophthalmologist they saw told them Joey needed eye muscle surgery immediately or he risked going blind in one eye. I’m not sure which eye he meant since both eyes had equal clarity of sight and the intermittent eye turn alternated from one eye to the other. When Joey’s dad asked the doctor which muscle or muscles were at fault. The surgeon replied that there was nothing wrong with Joey’s eye muscles but surgery was the way to fix it. I will be uncharacteristically brief. I would like to share with you a video posted on You Tube by a colleague, Dr. Lynn Marran of Yorba Linda, California. Dr. Marran interviews her patient Christina (in her late 50s) who shares her experiences with vision therapy.It's pretty easy to tell how happy this woman is and why. I work with people over 50 all the time, many with strabismus. One woman with whom I am currently working is Maria who has strabismus and is in her late 80s. She was 85 when we began working together. Nobody really knows how long she has had the problem, but she had been treated with stronger and stronger prisms over a five year period before we met. There was never any improvement with the previous treatment, and the medical community finally threw up its hands saying that they could not give her stronger prisms anymore and that surgery was the only solution. Three different doctors told her this.This was absolutely untrue. Just back from the 75th annual Middle Atlantic Optometric Congress in Pittsburgh, PA. I have been honored to speak at this meeting almost every year for the past 10 years. This year I spoke about communicating with the public about strabismus surgery and vision therapy. This year's meeting drew attendees from several states as well as Canada and New Zealand, who enjoyed lectures from Dr. Gregory Kitchener (Cincinnati, OH), Dr. Paul Harris and Dr. Marie Brodack (Southern College of Optometry, Memphis, TN) and Dr. David Cook (Atlanta, GA). This year's keynote speaker was Dr. Jan Richard Bruenech (pictured below) from Norway, who specializes in researching the microscopic structure of the muscles responsible for controlling eye movements. I guess I should thank my colleague Shirley Ha for sharing this very short article entitled RISK FACTORS FOR ESTROPIA from EUROTIMES columnist Priscilla Lynch. It was interesting, but also somewhat frustrating. The article presents a brief summary of the Strabismus Keynote Lecture by Lionel Kowal, MD (from Australia) at the 2015 World Congress of Pediatric Ophthalmology and Strabismus (WCPOS) in Barcelona. Dr. Kowal explained that conditions such as attention deficit hyperactivity disorder (ADHD) and autism spectrum disorder (ASD), or the drugs that are used in their treatment appear to be risk factors for esotropia (crossed eyes). If you’ve been to this website/blog before you probably know that I have a great deal of experience helping people with all types of vision problems, including strabismus. I have worked with many people who have had eye muscle surgery who still could not keep their eyes looking straight and/or working together properly even after one or more surgeries. Vision therapy has helped many of these people use their eyes together better, which is what really helps keep them looking straight. I have helped many very young people avoid the need for strabismus surgery thanks to vision therapy. Strabismus surgery is not nearly as successful as vision therapy at keeping the eyes working together properly, or even for keeping the eyes looking straight over time. It is frustrating to me that there is still such division between those who do vision therapy and those who do surgery. 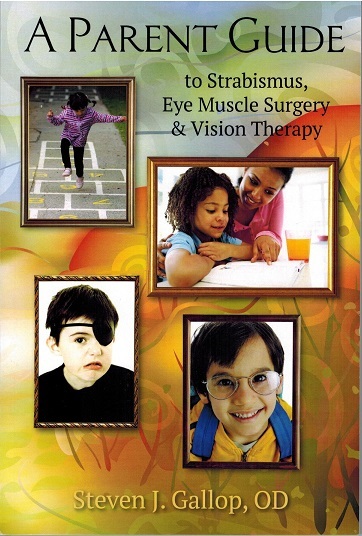 I have written about amblyopia (often referred to as lazy-eye) before on this blog as well as in my new book, A Parent Guide to Strabismus, Eye Muscle Surgery and Vision Therapy. It’s time for a quick update here. The medical community has insisted, beyond much clinical and research-based evidence, that amblyopia cannot be improved after the age of seven. The reason for this long held mistaken belief and the subsequent flawed advice that results is the knowledge that amblyopia cannot occur after the age of seven. Somehow this was turned into the confused notion that amblyopia could not be treated after age seven. This same belief system holds that amblyopia is an eye problem. Amblyopia is not an eye problem - just one reason the epithet lazy-eye is completely unsound. I am proud to announce that my new book: A Parent Guide to Strabismus, Eye Muscle Surgery and Vision Therapy has just been released by the Optometric Extension Program Foundation. Some years ago I got tired of hearing other doctors bad-mouthing behavioral optometry and vision therapy for treatment of strabismus (eye turns). None of these doctors had any firsthand experience with or factual knowledge of what behavioral optometry or vision therapy was about. All I kept hearing was that there was no proof that vision therapy worked, that there was no science behind it. I knew this to be untrue. I also knew just how well vision therapy worked for many people. A few years ago I had the great pleasure of consulting with Jolene, a mother who was interested in vision therapy for her two children and herself. Jolene lives in Malaysia and had become increasingly frustrated with the doctors and orthoptists she had access to. Her five year-old son, Caleb had eye muscle surgery at age two for an amblyopic eye that turned in. Caleb was not showing sustainable improvement after his surgery and the meager therapy that was offered - mostly just patching. Jolene refused to sit back and accept that it couldn’t get any better and began looking for answers. Eventually we were introduced to each other. I am not, and never have been, in Malaysia, but I could not resist the temptation to help Jolene and her children in any way I could. Last time I talked about eye exercises and the fact that vision therapy is not really about eyeballs and their muscles. It’s really about the brain and its neurological pathways. This time I want to go into a little more detail about the issue of eye muscles as it relates to eye muscle surgery. Eye muscle surgery (strabismus surgery) is often recommended for people who have difficulty using their two eyes in an integrated way. Many of these people are told that there is no alternative to eye muscle surgery if they want to get better. Parents are filled with anxiety by doctors insisting that surgery is not only necessary, but must be done immediately or the child might go blind in that eye. I have heard a number of parents relate this exact story from numerous doctors. Such hurried time frames and dire consequences are rarely if ever true. Also, surgeons know that in almost all cases the eye muscles are completely intact, but they still insist that surgery is the only answer. Click on title above for full postAre Your Eyes Getting Flabby? Do They Need Eye Exercises? 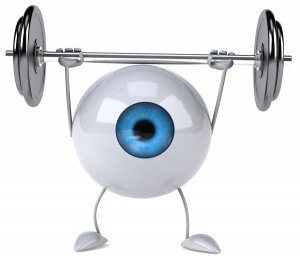 Are Your Eyes Getting Flabby? Do They Need Eye Exercises? People often ask me about eye exercises. Parents wanting to avoid eye muscle surgery for a child's crossed or lazy eye ask if their child is going to be doing eye exercises instead of surgery. Some want to know whether eye exercises will help their child read better, or to help them focus better when they have ADD or ADHD. Adult patients ask how eye exercises will help them work longer at the computer without getting a headache or fatigue, or to help them stop seeing double or reduce their nearsightedness (myopia). I understand why they would ask these questions and why they might think that since I'm an 'eye doctor' that people do eye exercises in my office. Of course, I don't think of myself as an eye doctor because I don’t really work with the eyes. I work with people who are having trouble with the visual process and visual development, most of which is neurologically (brain) based. Behavioral optometrists use vision therapy and lenses to help people perform their daily activities with greater efficiency and comfort. The vision therapy I provide is truly not eye exercises. Exercise implies that force and repetition are what cause the changes, that muscles are being worked out. And now for the exciting conclusion of this 2-D explanation of seeing 3-D and what to do when you have trouble doing it. In Part 1, we discussed the importance of effective eye teaming for seeing 3-D the way it was meant to be seen, whether in the movies or in real life. Strabismus is the condition where the two eyes are unable to present integrated signals and information to the rest of the brain and the body. Strabismus can be constant or intermittent. Strabismus often interferes with the ability to properly see in 3-D because the two eyes are unable to point at the same thing at the same time, either constantly or intermittently. Seen any good 3-D movies lately? Most of them aren’t the best movies ever made, but the 3-D can be spectacular and a lot of fun. Did it look 3-D to you? 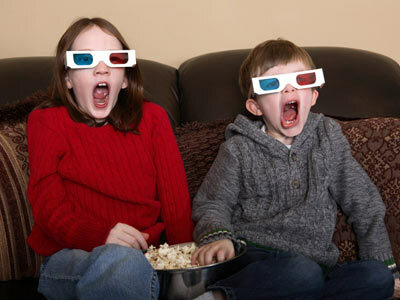 Did other people who saw the movie with you agree with how 3-D it looked to you? Did your eyes feel funny as you left the theater? Not everyone sees in 3-D, even in real life. Seeing in 3-D is a developed skill not a guarantee. We see in three dimensions because we have two eyes that can point at the same thing at the same time. This is called binocularity or eye teaming, a process that takes place in the brain. Eye teaming is the basis for depth perception. The brain signals the eyes where to point in space. Both of our eyes will point to a fairly precise location in space when this happens consistently and efficiently. It sounds so simple, and for most people it is…at least to a degree. Some people have better eye teaming skills than others. Most of us develop reasonable eye teaming skills through the normal course of events. However, many of us who do this may still have some weakness in eye teaming that is not obvious and may not cause problems for many years, if ever. Last time we began talking about amblyopia, an eye that cannot seem to see as well as its partner, and commonly referred to as a lazy eye. I mentioned that I didn’t like the term lazy eye, but I never actually got around to explaining why I don’t like the term lazy to describe such an eye. We will get there, I promise. But there are a few more things to cover first. Lazy eye is also used to refer to an eye that does not appear to be pointing where it should; this is formally known as strabismus. Eyes that turn in are called esotropic, eyes that turn out are exotropic. Unfortunately the most common treatment for eye turns, and still the only one offered or accepted by the most of the medical community, is eye muscle surgery or strabismus surgery. Strabismus surgeries pre-suppose that changing the effective length of an eye muscle will alter the function of that muscle in a desired way and to a desired degree. One problem with this theory is that these surgeries are, in the vast majority of cases, performed on healthy eye muscles. It is very rare for someone to have a damaged eye muscle - even when strabismus and/or amblyopia are present. Strabismus (eye turn) can occur for no apparent reason as well as along with amblyopia (lazy eye). Strabismus (which can also be referred to as lazy eye by many people) and strabismus surgery (eye muscle surgery) are important topics for behavioral optometrists and the people who come to them for advice and help. I have been working with people who have strabismus, including many who previously had strabismus surgery, for over twenty years. It is exciting to see the improvement in visual performance and general quality of life that takes place over the course of the vision therapy program as these people learn how to use the visual process better. And, as is increasingly uncommon these days, I work with each patient personally at every session so I get to see what’s happening in real time. I have also written quite a bit about strabismus and strabismus surgery over the years, but something a colleague recently posted on a listserve for behavioral optometrists inspired me to share his post and some of my own thoughts on the subject.